The Penlee Point Atmospheric Observatory (PPAO) is Plymouth’s first long term coastal atmospheric observatory. 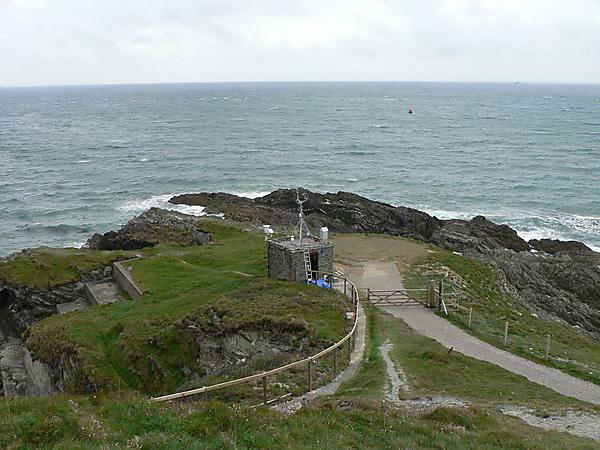 The Penlee Point Atmospheric Observatory (PPAO) is Plymouth’s first long term coastal atmospheric observatory to monitor atmospheric deposition and air quality over Plymouth Sound and in the western English Channel. The PPAO has recently been established as a collaborative project between Plymouth Marine Laboratory and the Marine Institute. Situated near the tip of the Rame Peninsula in South East Cornwall, the observatory provides an ideal location to intercept ‘clean sector’ Atlantic air masses as well as polluted coastal air masses impacted by ship emissions and Plymouth’s urban environment. Continuous observations at PPAO allow us to quantify the impact of anthropogenic activity on the coastal environment as well as the influence of the sea on the nearby land. Many parameters are being determined at the PPAO including important greenhouse gases (CO2 and CH4) and more reactive gases (SO2 and O3). Simon Ussher is leading the Marine Institute’s involvement, collecting and analysing coastal aerosols and rainwater for important trace metal and macronutrient (N and P) species. For further information please contact Simon Ussher, Tom Bell (tbe@pml.ac.uk ) or Mingxi Yang (miya@pml.ac.uk) or visit the website at http://www.westernchannelobservatory.org.uk/penlee/.